Take a look back at the 2004 Winter Carnival snow sculpture. Anyone who has spent time—perhaps a surprising amount of time—shaping a snowman’s head or centering a carrot nose would agree: snow sculpting can be serious business. 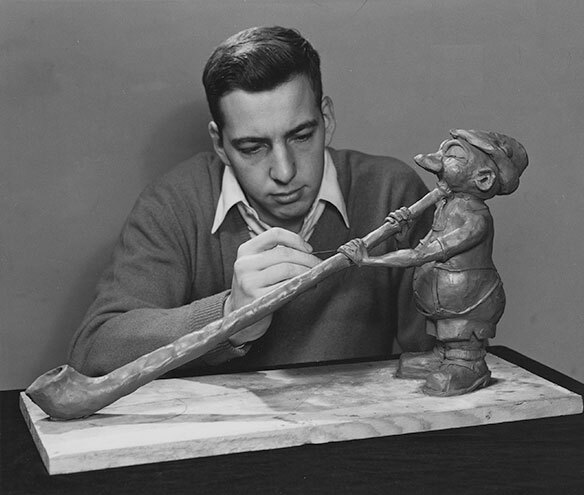 At Dartmouth, the craft has been practiced in a semi-official capacity for the past 90 years. 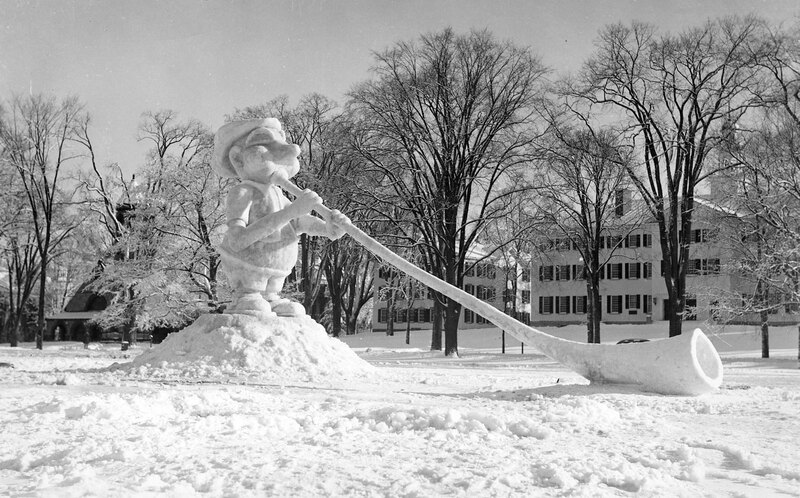 In the late 1920s, a new student position responsible for a “Center of Campus Statue” was appointed for Winter Carnival, Dartmouth’s legendary event that in its heyday drew thousands of visitors and television crews to campus. One of the first “all campus” sculptures—a lovely castle on Occom Pond—was created by H. Pennington Haile '24, likely for the 1925 Carnival. Since then the sculptures have ranged from the elaborate, such as a fire-breathing dragon (1969) or a whale with a snow spout (1982), to the simple yet imposing—such as a castle to celebrate 100 years of Carnival (2011). Most are based on the Carnival’s theme, chosen by students every year since the 1950s. (Carnival posters are also based on these themes.) A 20-foot tall young maiden, for example, is the sculpture for the 1967 Carnival, A Midwinter Night’s Dream. 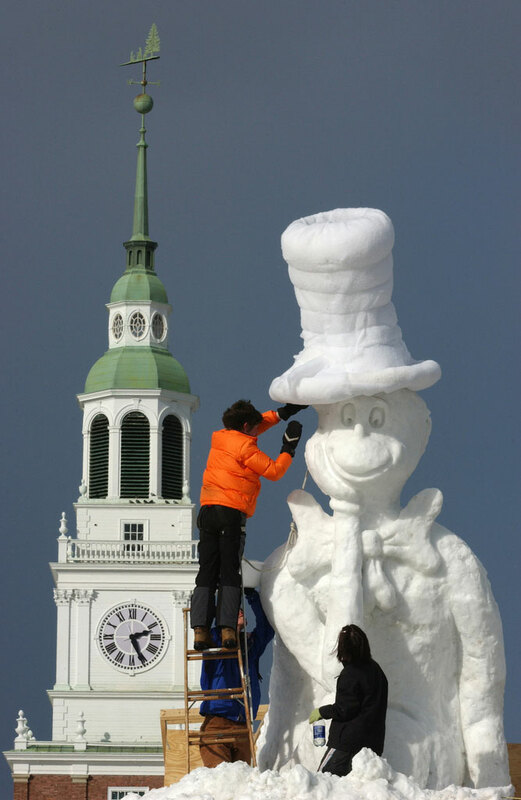 One of the most celebrated sculptures was the Cat in the Hat for the 2004 Carnival, Oh The Places It Snows: A Seussentennial. The image of the sculpture was featured in USA Today and other media, and it received more than 1,000 “likes” when it appeared on the Dartmouth Alumni Facebook page last summer. Victoria Solbert ’07, now a new business coordinator at an environmental certification company outside of San Francisco, was the artist behind that sculpture. “We were on a mission to make it really good,” she said of the project. “There was a core group of people dedicated to make it one of the best ones.” That group included Jeff Woodward ’06, Chris Polashenski ’07, and Dan Schneider ’07, who for his senior thesis built a conveyer belt to bring snow to the top of the sculpture. 1) Outreach. “Contact students other than those on the Winter Carnival or sculpture committees,” she said. 2) Manpower. “It takes a lot of people to pile up enough snow to carve,” advised Solbert. 3) Planning. Use a clay model and many drawings. “It’s really helpful to see it in 3-D,” she said. See a collection of Carnival sculptures.